Part Two of Craft Room Organization: If you can’t FIND the inspiration, BE the inspiration (AKA “Arne’s Mr. Rogers Factory Tour Dreams Come True”). 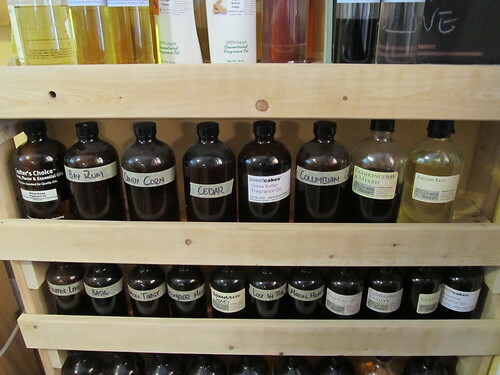 For part two, I want to talk about the shelves where I keep the majority of my soap fragrances. Above is the cork board and the first shelf. 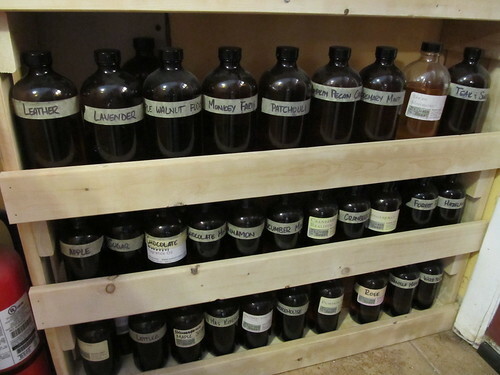 Unlike booze, my "top shelf" fragrances are not necessarily the ones I reach for the most often; they are a combination of overstock (won't fit in the amber bottles until I use a little more) and things I bought that didn't work out that I don't know what to do with yet. For example, with both "fresh baked bread" and "bay rum" I had to order from three or four different places to find the scent I liked. You would think that they'd all be similar, but... no such luck. Some of the Baked Bread I ordered smelled like popcorn, some smelled like nothing, some were close but no cigar. One day I will figure out what to do with them, but until then they are taking up space. Which is probably an honest thing you won't read about in other Craft Room Organization pieces -- everyone wants to seem perfect! And yes, I want to seem perfect as well, but I also want to be seen as honest. Sometimes I buy things that don't work out. Sometimes my work space is messy. Sometimes even as I try to organize, I have piles of things I don't know what to do with. 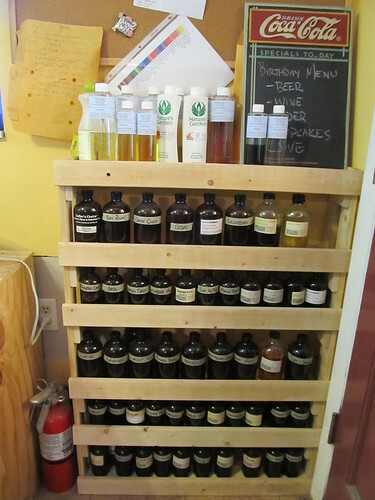 Editors Note: at this point in time, about a year later, I have worked through or thrown out everything on that top shelf, and have enough of the 16-oz bottles full of fragrances I use a lot that they've expanded to the top shelf. On the cork board are a number of things. Notes to myself; notes on fragrances; notes on guest soap sets I've put together; notes on the sock club. While I do have a little bit of a division going on here, overall I do sort my fragrances alphabetically. I grew up around writers and librarians, and believe that there's no simpler way to be able to find something easily. Unless you're dyslexic, the alphabet doesn't change - you should be able to trust it! The top shelf is Part One of my 16-ounce bottles. What warrants 16oz? Mostly my best-sellers; but occasionally there's an accident in there. For example, Bay Rum. Why do I have that in such a large quantity when I haven't even put any Bay Rum soap for sale in the shop yet? Well. That's a story... I had to buy a few of them before I found "the right" fragrance, and decided rather than just pitching the unused Bay Rum, I would blend them together with the Bay Rum that worked out. Note to Bay Rum lovers: I have made some and asked a Bay Rum-loving friend to test a bar. He has pronounced them fabulous, so expect to see them start to appear in the shop soon. Editor's Note: and here they are! 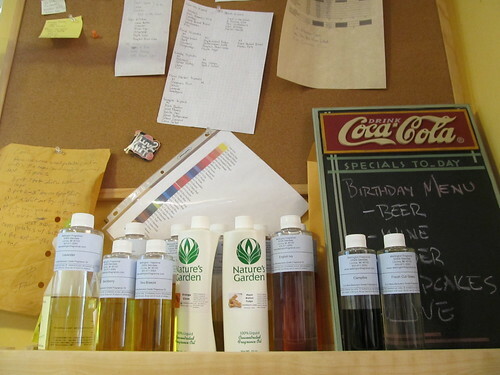 The second shelf contains the 8-ounce bottles that I use most often. The third shelf is Part Two of my 16-ounce bottles. The bottom two shelves are mostly two-deep (one bottle in back of the other bottles) and are a combination of fragrances used for soap clubs that I'm still evaluating before buying more of; holiday fragrances; and fragrances that are not popular enough to warrant investing in 16oz of. Having said that, there are some fragrances that are getting more popular, and I do need three or four more 16oz bottles (I just haven't gotten around to purchasing them yet). Stay tuned for part three, which will be about my sink and counter-top areas. Meanwhile, please feel free to ask any questions -- feedback and questions let me know I'm not talking into a void! That would be a good name for a catch all batch of soap … " Close; but no Cigar" the left overs blen.